Gotta’ collect them all. The newest update for Gears of War 4 brought you by The Coalition will have two returning classic maps and over 280 new cards. Gears of War 4 is celebrating the new year with the release of the Series 2 cards for use in the multiplayer. 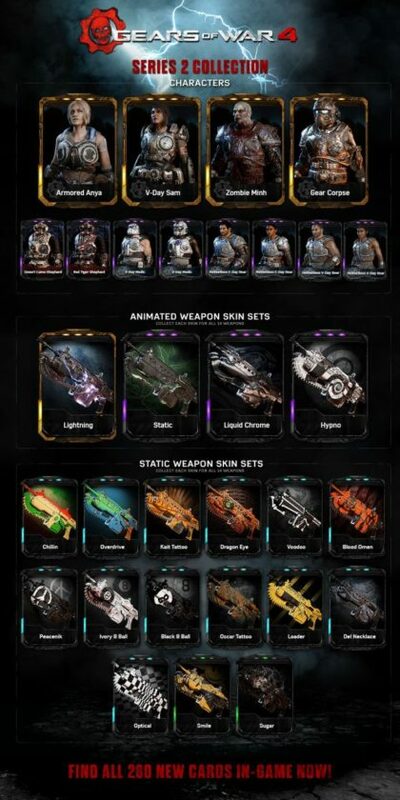 Cards include new characters and weapon skins. The new characters themselves will be the first wave of Legacy Characters, like Armored Anya and Sam in their Gears of War 3 outfits. Another fan-favorite coming is Zombie Minh from Gears of War. Weapons are getting a whopping 260 new skins, from animated lightning to cool hypnotic swirls. 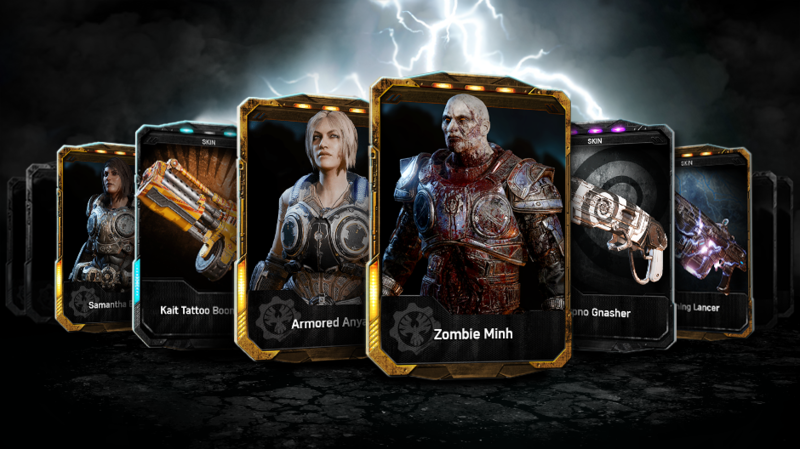 Series 2 cards can be obtained in standard Gear Packs using in-game currency or cash. If you bought the Season Pass, there’s going to be a new Airdrop on January 13th along with a Bounty Gear Pack every Friday. Since launch, our team has continued to work hard on new features to improve the Gears of War 4 online experience. Alongside the release of Series 2, Title Update 3 brings the first phase of a hotly requested community feature – quit penalties. Our new matchmaking timeout system punishes leaving the fight early, while our Join In Progress feature gives you the flexibility to rejoin the battle for a short time – if, say, your dog tripped the power cable. It happens. This new update also contains improvements to Spectator Mode, keeping the action front and center while adding new features that give you more information about the intense eSports action playing out live. Both maps are playable today through the Season Pass today on the Developer Playlist. Everyone one else can play them on January 17th. The two classic maps returning are Blood Drive and Clocktower from Gears of War 2 & 3. Gears of War 4 is out now on Xbox One and Windows 10. It got 9/10 in Wccftech’s review and was included in the list of best shooters released last year.